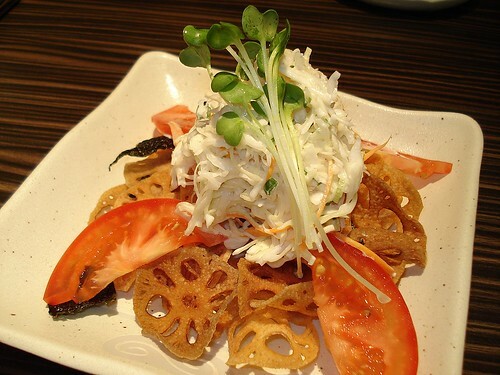 Japanese coleslaw with renkon (lotus root) chips, originally uploaded by Camemberu. Hubby who doesn't like The Central acquiesced to come here for this. We started with the coleslaw with renkon chips (S$6.50, this month's special, available til end March). This was so delicious, and the renkon chips so addictive, we asked for another as soon as we polished it off. We told the waitress they should put this on the regular menu! 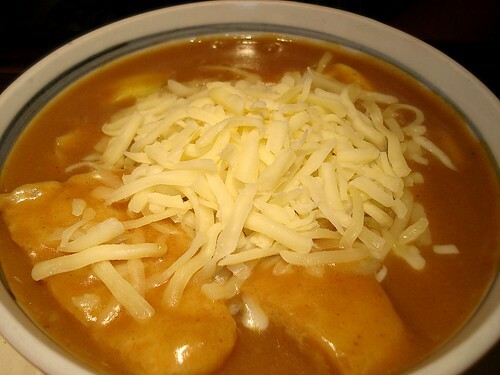 Cheeeeeezu curry udon!, originally uploaded by Camemberu. Hubby went for the cheese curry udon (S$15.50). The cheese topping did not look as huge as it didn't have any tonkatsu or ebi tempura to rest on. The curry is not bad. I'm not a Japanese curry fan because of its mild and sweetish nature, but I liked this (especially after we put a ton of chili flakes into it). Next time I am coming here to have my own bowl! 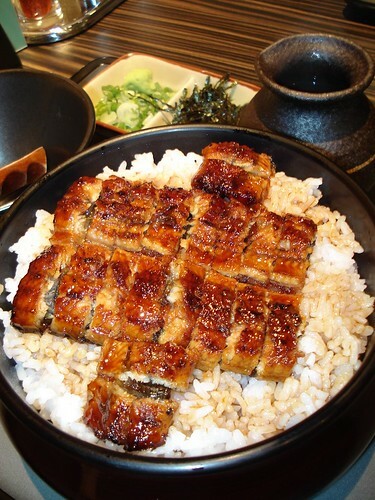 Hitsumabushi (bowl of grilled eel atop rice): one dish with three different ways to eat it, originally uploaded by Camemberu. I had the grilled eel dish called hitsumabushi (S$18), because I had been craving my good experience at Unasho in Akihabara. I hoped this place would at least meet some standards, unlike local Japanese chains like Ichiban Sushi. Well, Wakashachiya's version was decent enough with good quality ingredients. If you want double the amount of unagi, you can go for the deluxe version (S$27). Second step: add condiments and enjoy, originally uploaded by Camemberu. Hitsumabushi is fun because you get to play with your food. There are three different ways of eating it. You can divide the bowl into four portions. 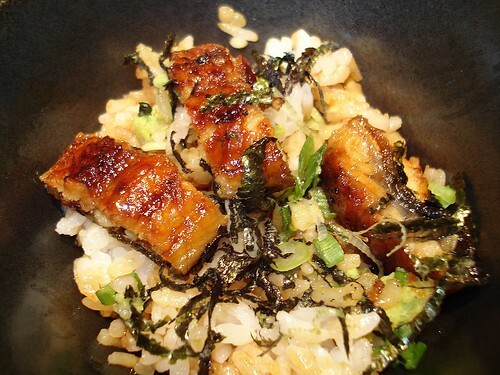 The first one you can eat as it is - just eel and rice. The second one you can enjoy with condiments of nori, spring onions and wasabi. Third step: enjoy with hot dashi as ochazuke, originally uploaded by Camemberu. The third method is an ochazuke. 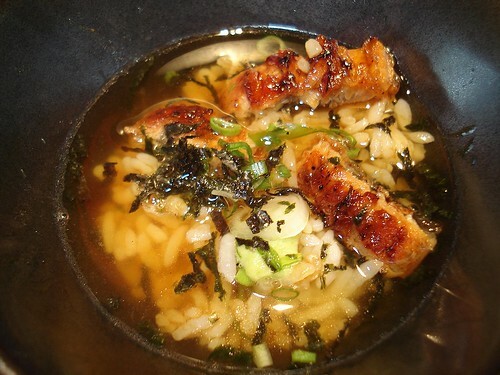 Pour the hot dashi stock over your eel, rice and condiments to create a "rice tea". The stock here has a strong charcoal or roasted taste, typical of ochazuke. But I still prefer Unasho's more savoury version. 若鯱家 Wakashachiya is at The Central, above Clarke Quay MRT, originally uploaded by Camemberu. Service here is polite and the lead waitress spoke some Japanese. She was also very conscientious about details and made sure the tables were all laid out neatly, that nothing was out of place. Enthusiastic commitment to the job! Either that or she is the boss of the place! Well, for a restaurant chain, Wakashachiya is better than expected. I enjoyed myself and will certainly be back again. 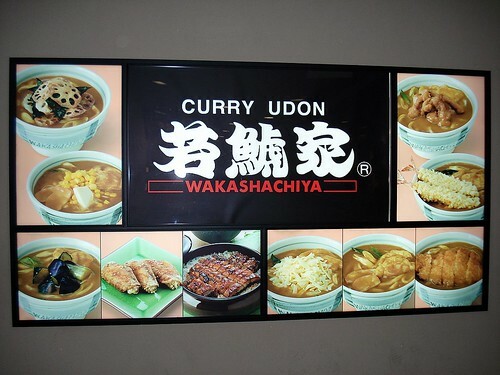 In fact, looking at these pictures, I'm craving some curry udon already! hope they can come to KL too , sure they will create a hot wave ! Which uses a lot more Shiratake, I can't wait to try the Waka versions. Thats some seriously cool presentation! It all looks so yummy! have you tried Santouka(sp?) I love their ramen there and that braised pig cheeks. Its hidden between Grains and Billy Bombers. Wow! Another Jap food outlet, i think im gg to pick myself up to try it soon~ But after my exam,haha! Southernoise, it's mainly the building design - very confusing, so hubby has instant distaste! Ramen Santouka was ambitiously the place I had planned to adjourn to after Wakashachiya. Greedy ah, after udon want to eat ramen - but ended up too full. So that will be another day. But have seen so many good reviews about it! ahh i know this one, heard its quite good for their udon? but yet to try despite going to Central couple of times for meals already.